Roaring Brook Press, 9781596438101, 56pp. When George Ohr's trove of pottery was discovered in 1967, years after his death, his true genius was discovered with it. The world could finally see how unique this artist really was! Born in 1856 in Biloxi, Mississippi, George grew up to the sounds of the civil war and political unrest. When he was 22, his boyhood friend introduced him to the pottery wheel. The lost young man suddenly found his calling. "When I found the potter's wheel I felt it all over like a duck in water." He started creating strangely crafted pots and vases, expressing his creativity and personality through the ceramic sculptures. Eventually he had thousands at his fingertips. He took them to fairs and art shows, but nobody was buying these odd figures from this bizarre man. Eventually he retired, but not without hiding hundreds of his ceramics. Jan Greenberg and Sandra Jordan, authors of the award winning Ballet for Martha, approach this colorful biography with a gentle and curious hand. Jan Greenberg is one of America’s most prominent writers about art and artists for young readers. Jan Greenberg lives in St. Louis. Her art-related books co-written with Sandra Jordan include Action Jackson (a Sibert Honor Book), as well as books on Van Gogh, Frank O. Gehry, Andy Warhol, and Chuck Close. Sandra Jordan is one of America’s most prominent writers about art and artists for young readers. Sandra Jordan lives in New York, New York. Her art-related books co-written with Jan Greenberg include Action Jackson (a Sibert Honor Book), as well as books on Van Gogh, Frank O. Gehry, Andy Warhol, and Chuck Close. “Eccentricity may sometimes be a taxing quality in real life, but on the page it is an easy source of delight. The flamboyant 19th-century Mississippi artisan George E. Ohr took pride in his peculiarity, calling himself a "rankey krankey solid individualist." Born several years before the Civil War, the man who would become posthumously famous for creating dazzlingly imaginative vases, bowls and teapots worked in an atmosphere of deprecation in his own era. 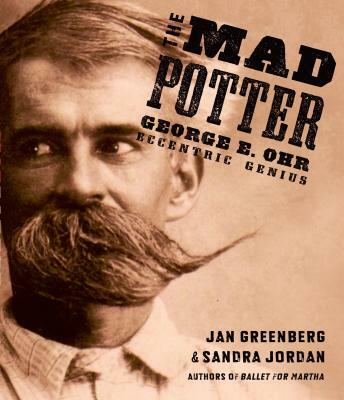 Ohr's bittersweet story leaps from the nonfiction pages of Jan Greenberg and Sandra Jordan's "The Mad Potter: George E. Ohr, Eccentric Genius" (Roaring Brook, 56 pages, $17.99).